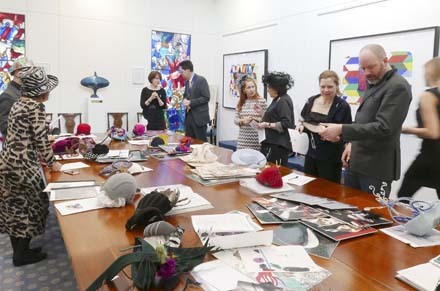 The Worshipful Company of Feltmakers of London held their annual Design Awards at the beginning of April at Haberdashers’ Hall. This annual competition for European students and apprentices was extended for the first time to include those with a start-up business of less than two years. The high standard of work never ceases to amaze the judges, with innovative new designs, processes and shapes that take the traditional felt material to a far more exciting level. The judging started at 10am and shortly after, the jury were joined by the Lady Mayoress, the Master Mr Peter Simeons and his wife, and the Sheriff’s Consorts Mrs Samantha Bowman and Mr Stephen Rigden, with the ladies wearing their own stylish headwear. Everyone had the opportunity to comment and give their opinion whilst the hats were modelled and thoroughly inspected. At 12 noon the winners were announced. 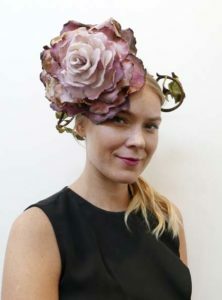 Taking First Prize was Charlotte Roseman, from Kensington and Chelsea College, who had designed a felt rose headpiece, held in position by its stems and thorns that wrapped around the head. Each of the petals had been individually coloured and shaped, the outer ones being burnt and ‘aged’ to produce a sensation of foreboding. Her inspiration was taken from the illustrations created for The Fairy Tales of the Brothers Grimm, particularly the unsettling contrast of the warm central glow fading out to dark twisting branches and brambles at the outer edge, giving a feeling of dark, lurking enchantment. 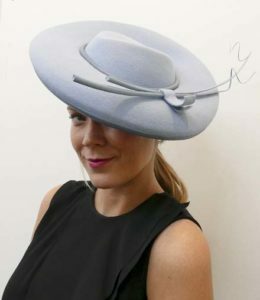 Charlotte receives £1200, plus work experience with royal milliner Rachel Trevor-Morgan and with Walter Wright Ltd. Charlotte will be presented with her prize at the Feltmakers’ Banquet, held at Mansion House in June. 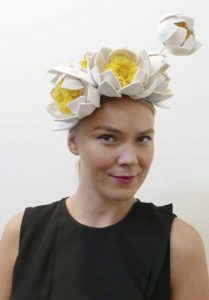 Second prize was awarded to Giulia Mio, of Giulia Mio Haute Couture Millinery, using a modern floral theme, and comprised a headpiece of felt lotus flowers positioned on a millinery wire, each one finished with a bright yellow stamen. Giulia was exploring graphical ideas for her entry when she came across a picture of lotus flowers on her phone that she had taken at the Botanic Gardens in Oxford. When she saw how defined and almost architectural the petals were she decided to explore their purity and geometry to create a floral crown. Giulia receives £600. 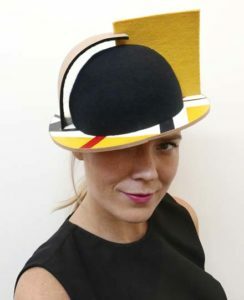 Third prize was awarded to Ania Zydron, from Kensington and Chelsea College, for her contemporary take on a felt bowler hat. Using simple mathematical shapes in primary colours in a contrast of felt, veneer and acrylic, the design was a take on the Suprematism art movement led by painters Malevich and Lissitzky in the 1920s. This saw the rejection of natural shapes in favour of the creation of geometric forms. The entry exploits felt’s rigidity and strength and features contrasts between wool and synthetics. Ania receives £450. For Commercial Appeal the prize was awarded to Paul Marcher, from the Fashion Institute Vienna, for his light blue fur felt hat with a simple quill trim. The judges commented on the classic elegance of this design, and also the fit and balance that worked well together. 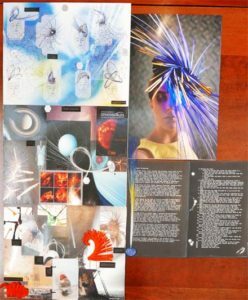 Paul completes his 3-year course in Vienna this year and for his entry wanted to create a hat that was elegant and modern, with clean lines and a contemporary finish. After completing college he is planning to move to England and to study costume design. Paul receives £200. 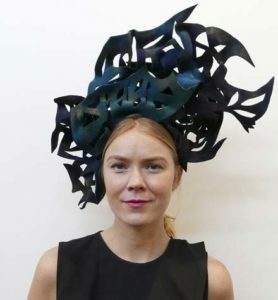 The Prize for Innovative Use of Felt was awarded to Claire Bennett, from Kensington and Chelsea College, for her bold felt headpiece that stood high and framed the face. The headpiece was perforated, cut and hand blocked into a shape that fitted the head well. The organic shape was inspired by a walk through woodlands, with the sun glinting through the ferns, imagining when the woodland creatures come to life. Claire receives £200. The Craftsmanship Award was given to Hanna Zachoval, from the Fashion Institute Vienna, for her felt beret adorned with colourful felt flowers. The leather edge on the band was perfectly finished. 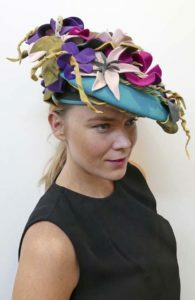 Hilary Alexander loved this hat and the fact that it was submitted by a 15-year-old student, and she said it was very fashion forward for A/W 2017. The design was inspired by the background music of the Yves Saint Laurent perfume commercial for Black Opium. The track ‘My Head is a Jungle’, by DJ Wankelmut and Emma Louise, was a crucial part of her inspiration in making the ‘jungle hat’. Hanna receives £200. The Artwork and Presentation Prize was awarded to Millie Winson, from Northampton College. Her mood boards, descriptions and images were proficiently documented and very well presented. Article and photographs by Carole Denford and published here by courtesy of The Hat magazine.